April 7, 2015, MCLEAN, VA – Corcentric, a leading provider of accounts payable automation and electronic invoicing software, announced today that it will host a new Accounts Payable Webinar, “The 5 Hidden Costs of Paper Invoices,” on Tuesday, April 14, 2015 at 2:00 PM ET/11:00 AM PT. As companies look for areas within the enterprise where efficiencies and savings can be captured, they may not be looking at Accounts Payable. That may be due to the fact that AP is often regarded as simply a cost of doing business. 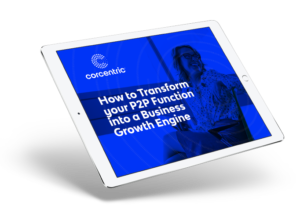 Corcentric’s latest Webinar reveals that manual processing of paper invoices can be quite costly; more than most companies might realize. This Webinar will provide valuable, actionable information for accounts payable professionals as well as assisting management in making the case for implementation of an AP automation solution within their department. This Webinar will also feature a demo of COR360TM, Corcentric’s comprehensive Accounts Payable workflow solution.